Kamala Subramanian is a Washington, DC area artist and proud of her mixed heritage of South Asian Indian and African American. Born and raised in the District of Columbia, graduated with a BFA from Temple University, Tyler School of Fine Arts, Rome, Italy and Philadelphia, Pennsylvania with post graduate work in Child Psychology at Maryland University, College Park, Maryland and teaching credits at Bowie State College. Subramanian has taught art at the Smithsonian’s Discover Graphics Program, a Kennedy Center Fellow and several schools throughout the DC area. She was commission to create a public art mural for the Anacostia Library in South East D.C.
My art is evidence of my heritage, observations and emotions. The saturated color palette reflects the exploration of my shared cultural heritage of India, Africa, and America. My use of multi-layers and interwoven lines resonate my influence of the intense hues within the textiles from Indian saris to the intricately woven patterns of the Kente clothe. As I try to convey a duality of celebrating the joys within my life and what my ancestors have passed on to me I am dismayed at the callous treatment of the politically impotent voices of those at the extreme ends of their life cycles. My mediums and colors vary as do the people of this earth but also convey how much we are intertwined and connected to one another through time with the colors of life, the rhythm of music the language of art and the tears or laughter of any child. When I incorporate the human form the images that I use focus on the very young or very old; those who are most vulnerable within our society, those so often with the quietest voice. I allow my colors to speak for them. 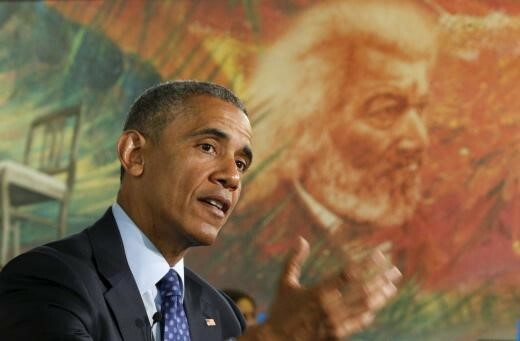 This is a portion of my Anacostia Library Mural behind President Obama.